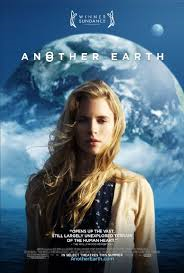 I went in to Mike Cahill’s 2011 offering Another Earth right when it came out, intrigued. The concept of a second Earth suddenly appearing in the sky, as implausible as it is, tickles my science geek. The film tells the story of Rhoda (Brit Marling), who caused an accident that left John (William Mapother) in a coma while killing his wife, son and unborn child; Rhoda is adrift in the world and wants to make amends to John, so she poses as a maid after losing her nerve to say that she killed his family. Things get trickier when they start to fall for each other amidst the backdrop of a second Earth looming in the sky. This one is far more drama than scientific accuracy, but it’s a good film. Available on iTunes and GooglePlay, here are five reasons to give it a shot. Soft spot for this one. It’s been a while since I watched an actor or actress and have thought to myself, “Watch this one. He/she is going to do some incredible things.” I got that feeling when I watched Brit Marling for the first time in this, and everything else I’ve seen her in reinforces this initial reaction. She demonstrated a wide range of emotions, and didn’t have to open her mouth once to over-emote. There’s something likable about her: she’s not one of those try-hard actors, pulling a trademark face or trying to look deep. She strikes me as real. The way she tells the story of the Russian cosmonaut… I want her to tell me more stories. I felt like a little kid who had someone new visiting the classroom at storytime. I hope to see more of her work in the future. Cahill has some striking images, and a good technique. The quick cuts and fuzzy shots interspersed throughout the film give it a surreal quality, and in a good way. He’s also not afraid to get up close to his actors and go out of focus, as though we’ve put our heads right next to theirs. The result makes the film feel more intimate. He’s also not afraid to pull back so that we can get some perspective, and his eye for a shot is quite good. Some of my favorites are the shots of the second Earth in the sky with the moon. 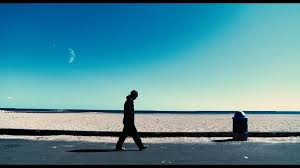 The command of color – particularly the color blue, which is my favorite – creates a shot that is beautiful and moving. Beauty at a point of pure sorrow and solitude. Going into this, even from the plot description, you know that this couple has some pretty harsh odds stacked against them. Killing someone’s wife and child while drunk is something that’s tough to overcome. And yet you want John and Rhoda to work. They’re compatible intellectually, and they really do help each other heal. There’s no magic, “… and I saw her from across the room,” completely gob-smacked expression. This is far more gradual, and you see where these two lean on each other; you get to see that trust being built, and those connections being forged. When you can get me to defy logic and pull for an on-screen couple, that’s something special. The audience often gets a look at the shattered life of the victim of a DWI/DUI crash; that’s not a bad thing, as the people that think it’s okay to get behind the wheel of a car completely smashed should be aware of what they can potentially do to someone. However, Cahill presents a different cautionary tale: the wrecked life of the driver that caused the accident. Rhoda goes to jail and punishes herself after she gets out. Her life is destroyed, and we get to watch someone with a promising future go through a massive depression and self-imposed exile. We watch her attempt to atone for what she’s done. The way it’s presented creates an effective punch: we like Rhoda, and we can see what this has done to her. It’s a subject that doesn’t get touched much, because we want to feel sorry for the victim, who was truly wronged. This film presents that it’s okay to look at a crappy situation and feel bad for everyone involved. Watch this if only to watch William Mapother’s John play a saw in a lone auditorium. It’s a sticking point for me. Between the romantic gesture and the sound, it had me. I will admit this right now: for years, he was always Creepy Ethan from Lost to me. He stopped being Creepy Ethan in this film, in part because of this scene. It’s not often that you get to see your go-to baddie play someone who makes a romantic gesture that you adore. Cannot stress enough how well this pairing works. Again, while the science may not be that strong, it’s a good character piece that speaks to higher themes of perspective, honesty and forgiveness. Check it out.